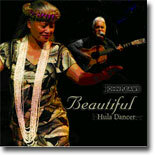 Comments: Slack Key guitarist John Keawe, a contributing artist on Hawai`i's 1st Grammy Award in 2005, Na Hoku Winner, and a recipient of two Hawaii Music Awards, presents his 8th CD release titled "Beautiful Hula Dancer". This album features 12 slack key instrumentals and 4 vocals, all are original creations.. John uses several diffent tunings on this recording, whch create a variey of colors and voicing. This new recording brings to the forefront the uniqueness and honesty of John's music.